MARK BROADIE HAS WRITTEN A GOLF instructional book that won’t help you hit longer drives, improve your short game, or keep you from hitting truly awful shots. 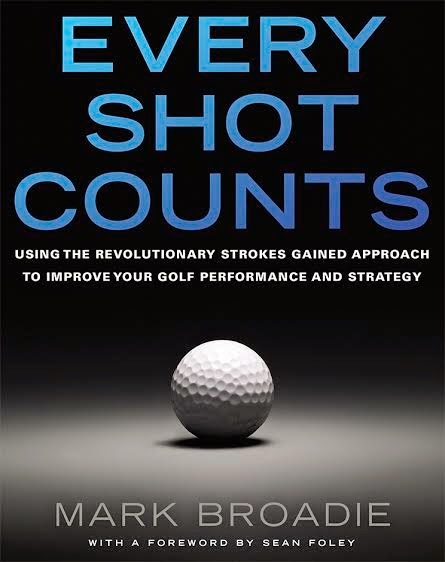 However, his new book, EVERY SHOT COUNTS: Using the Revolutionary Strokes Gained Approach to Improve Your Golf Performance and Strategy will change the way you play your game, and how you judge a player on the PGA Tour. Mark Broadie is a college professor. Not only is he an academic, but he teaches courses in the Columbia Business School such as Derivatives, Security Pricing: Models and Computation. Yes, I know, geek classes. Still, Mark doesn’t look like a geek. Meeting him in his campus office, he appears like a guy who is ready to slip out a back door to play a quick nine holes. Mark, by the way, plays to a 4 and has won both his club championship, and the senior championship, at his home course, Pelham Country Club in Westchester, New York, site of the 1923 PGA Championship when Gene Sarazen beat Walter Hagen. What he has done, as a player and a professor, is to combine his scholarly research and his love of golf, to elevate golf statistics to a much higher and useful level. He created Golfmetrics, a software application that captures and keeps golf shot data that quantifies the differences in shot patterns between players of different skill levels. Today, he is helping PGA Tour pros and amateurs alike dramatically improve their scores by studying how they play the game and learning what part of their game needs improvement, and why. Mark Broadie’s work hasn’t gone unnoticed. He has been selected as a member of the USGA’s handicap research team, writes a monthly column for Golf Magazine, and blogs every Monday morning on www.pgatour.com about that week’s tournament, breaking down and assessing the PGA Tour’s Shot Link data that the tour collected by laser technology on every shot hit at the just-concluded tournament. And when he isn’t doing that, he’s advising tour pros’ coaches on their player’s shortcomings, based on the statistics he has harvested and evaluated. What Mark Broadie has done for golf can be best explained by comparing it to the book (and movie) Moneyball written by financial guru Michael Lewis. Moneyball is about how the Oakland A’s built a winning baseball team using a sophisticated approach towards scouting and analyzing players. In other words, applying Wall Street tactics to the world of professional sports. Mark, however, was seeking answers to help his own game, and the game all golfers play, when he began his research in 2001. He wanted to know what is the best way to play a shot? How does a player know when to go for the green or lay up? He wanted to know the answers to the endless decisions a player has to make in a round. With his academic background, and the knowledge he possessed from being a low handicap player, he began his research by using his computer program called Golfmetrics to collect, store, and analyze golf data. Using his home golf course, Pelham Country Club, as his research site, he enlisted friends and fellow members to collect data on their games. Players were asked to place an X in a page yardage book, containing an image of the hole, indicating where their ball landed. After the round, the data was entered into a computer. Between 2003 and 2012, the ShotLink database gathered information on more than 10 million shots. In a forward-looking undertaking the the PGA Tour wanted to update their scoring system as a way to improve fan experience at tournaments, and provide better information for the media. It is the long game that makes the biggest difference in scores between pros and amateurs. Long hitters not only hit the ball farther, they have more consistent swings, so they’re more likely to play their next shot from the fairway. Shots from 100 yards or less account for only 60 to 65 percent of all shots. Eliminate putts from three and a half feet or less, and the figure drops to 41 to 47 percent. Practicing putting and chipping provides the most benefit to anyone’s game. Consistency improves a golf round more than any other factor. While the numbers tell the story (and the score) of everyone’s round, Mark also knows that players need to assess the unique circumstances of each shot, from the lie, to the wind, to the pin’s location. Mark Broadie has taken that to heart. At Pelham Country Club where he’s been club champ, he can play. At Columbia University Graduate School of Business where he teaches, he can count. Now his new book EVERY SHOT COUNTS proves he can handle them both, like a pro. John Coyne is a bestselling author whose latest golf novel is The Caddie Who Won the Masters. Learn more at John Coyne Books.